abyssal plain -- The ocean floor offshore from the continental margin, usually very flat with a slight slope. accrete -- v. To add terranes (small land masses or pieces of crust) to another, usually larger, land mass. alkaline -- Term pertaining to a highly basic, as opposed to acidic, subtance. For example, hydroxide or carbonate of sodium or potassium. allochthonous -- Refers to something formed elswhere than its present location. Antonym of autochthonous. alluvial fan -- n. A fan-shaped deposit of sand, mud, etc. formed by a stream where its velocity has slowed, such as at the mouth of a ravine or at the foot of a mountain. alluvium -- n. a deposit of sand, mud, etc., formed by flowing water; alluvial - adj. amber -- Fossilization where the organism is entrapped in resin and preserved whole. andesite -- Igneous volcanic rock, less mafic than basalt, but more mafic than dacite; rough volcanic equivalent of diorite. anticline -- A fold of rock layers that is convex upwards. Antonym of syncline. archipelago -- n. A group of islands; an expanse of water with scattered islands. asphalt -- A dark bituminous substance found in natural beds. Residue from petroleum distillation. autochthonous -- Refers to something formed in its present location. Antonym of allochthonous. Banded Iron Formation -- n. Rock consisting of alternating light and dark layers of iron-rich chert (the dark layers have more iron minerals) formed from 3.8 to 1.7 billion years ago. basalt -- Highly mafic igneous volcanic rock, typically fine-grained and dark in color; rough volcanic equivalent of gabbro. basement rock -- n. The oldest rocks in a given area; a complex of metamorphic and igneous rocks that underlies the sedimentary deposits. Usually Precambrian or Paleozoic in age. basin -- n. Any large depression in which sediments are deposited. Basin and Range Province -- n. One of the most extensive systems of fault-bounded mountains separated by sediment-filled valleys, extending across Idaho, Oregon, Nevada, Utah, Arizona, New Mexico, California, and northern Mexico. Basin and Range topography The surface features typical of the Basin and Range Province. bedrock -- n. The general term referring to the rock underlying other unconsolidated material, i.e. soil. biostratigraphy -- n. The study of rock layers (e.g., distribution, environment of deposition, age) based on their fossils; biostratigraphic- adj. biostratinomy -- The study of what happens between the death of an organism and burial. Part of taphonomy. bioturbation -- n. The disturbance of sediment by organisms, e.g. burrows, trails, or complete mixing. blueschist -- Metamorphic rock formed under great pressures, but not so great temperatures. brackish -- adj. Slightly salty. calcareous -- adj. Term used to describe a structure, secreted by an organism, that consists of or contains calcium carbonate (CaCO3), e.g., the shell of a bivalve. caldera -- n. A large circular volcanic depression, often originating due to collapse. carbon film -- Thin layer of carbon remains of past life found in sedimentary rocks. carbonate -- n. (adj.) A mineral composed mainly of calcium (Ca) and carbonate (CO3) ions, may also include magnesium (Mg), iron (Fe) and others; n. rock or sediments derived from debris of organic materials composed mainly of calcium and carbonate (e.g., shells, corals, etc.) or from the inorganic precipitation of calcium (and other ions) and carbonate from solution (seawater). For example, limestone or dolomite. carbonate platform – n. A broad (100s of meters), flat, shallow submarine expanse of carbonate rock, more common in the early-middle Paleozoic. carbonate bank – n. A narrow (10s of meters), fairly flat, shallow, submarine plateau of carbonate rock, more common from the middle-late Paleozoic to the present, e.g., the Bahama Banks. casts -- Fossils formed when water containing minerals leaks into a mold. The minerals harden to form a copy of the original structure or organism. chalk -- A soft compact calcite, CaCO3, with varying amounts of silica, quartz, feldspar, or other mineral impurities, generally gray-white or yellow-white and derived chiefly from fossil seashells. chert -- Hard, dense sedimentary rock, composed of interlocking quartz crystals and possibly amorphous silica (opal). The origin of the silica is normally biological, from diatoms, radiolaria or sponge spicules. Synonymous with flint. clast -- n. An individual grain or constituent of a rock; clastic- adj. Describes a rock or sediment composed mainly of fragments of preexisting rocks or minerals that have been transported some distance from their place of origin, e.g., sandstone, shale. compactions -- Fossils that have undergone some degree of flattening of their three-dimensional structure. compression -- Fossil formed when an organism is flattened (compressed) and a thin film of organic material from its body is left in the rock. concretion -- n. A hard, rounded mass, commonly of silica, calcite, dolomite, iron oxide, pyrite, or gypsum, that formed within a rock from the precipitation of these minerals around a nucleus, such as a leaf, bone, shell, or fossil, and ranging in diameter from centimeters to meters. conglomerate -- A coarse-grained sedimentary rock, with clasts larger than 2 mm. continental crust -- The Earth's crust that includes both the continents and the continental shelves. continental margin -- n. The ocean floor from the shore of continents to the abyssal plain. continental rise -- n. Part of the continental margin; the ocean floor from the continental slope to the abyssal plain. The continental rise generally has a gentle slope and smooth topography. continental shelf -- n. The part of the continental margin from the coastal shore to the continental slope; usually extending to a depth of about 200 meters and with a very slight slope, roughly 0.1 degrees; includes conetinental and oceanic sediments down to the ocean floor. continental slope -- n. Part of the continental margin; the ocean floor from the continental shelf to the continental rise or oceanic trench. Usually to a depth of about 200 meters. The continental slope typically has a relatively steep grade, from 3 to 6 degrees. copal -- Brittle aromatic yellow to red resins of recent or fossil origin, obtained from tropical trees. core -- That portion of the interior of the Earth that lies beneath the mantle, and goes all of the way to the center. The Earth's core is very dense, rich in iron and the source of the magnetic field. craton -- n. A part of the Earth's crust that has attained stability and has been little deformed for a long period of time, refers only to continents; cratonic- adj. cross-bedding -- (n) The arrangement of sedimentary beds tilted at different angles to each other, indicating that the beds were deposited by flowing wind or water. crust -- n. The outermost layer of the Earth, varying in thickness from about 10 kilometers (6 miles) below the oceans, to 65 kilometers (about 40 miles) below the continents; represents less than 1 percent of the Earth's volume. diagenesis -- All of the changes that occur to a fossil (or more generally any sediment) after initial burial; includes changes that result from chemical, physical as well as biological processes. The study of diagenesis is part of taphonomy. epicenter -- Point on the Earth's surface directly above the focus of an earthquake. erosion -- n. The processes by which materials of the Earth's crust are worn away, loosened, or dissolved while being transported from their place of origin. 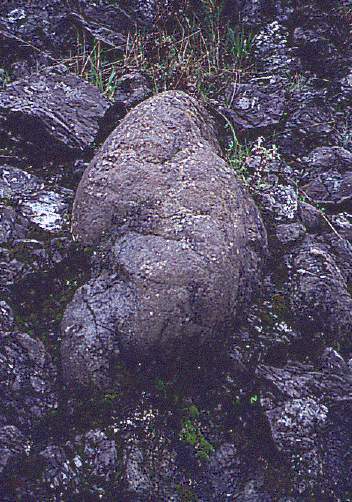 erratic -- n. A large, isolated boulder left behind by a glacier. escarpment -- n. A steep or vertical cliff, either above or below sea level. esker -- n. A ridge of glacial sediment deposited by a stream flowing in and under a melting glacier. estuary -- n. An area where fresh water comes into contact with seawater, usually in a partly enclosed coastal body of water; a mix of fresh and salt water where the current of a stream meets the tides; estuarine– adj. evaporite -- n. a deposit of salt minerals (e.g., halite, gypsum, anhydrite) left behind by the evaporation of seawater, usually forms within a restricted basin. extrusive -- Igneous. Antonym of intrusive. fault -- n. (v.) A fracture, or large crack, in the Earth's crust where one side moves up/down/sideways relative to the other; fault block- n. pieces of crust that have slipped into or alongside a fault; fault zone- n. an area with multiple faults. felsic -- Term used to describe the amount of light-colored feldspar and silica minerals in an igneous rock. Complement of mafic. focus -- The initial point within the Earth that ruptures in an earthquake, directly below the epicenter. fold -- Bent rock strata. fossil -- Any evidence of past life, including remains, traces, imprints as well as life history artifacts. Examples of artifacts include fossilized bird's nests, bee hives, etc. fossil record -- All of the fossils that have existed throughout life’s history, whether they have been found or not. fossiliferous -- adj. Rich in fossils. freezing -- To preserve an organism without any significant alteration to its chemical composition by subjecting it to freezing temperatures. gabbro -- Highly mafic igneous plutonic rock, typically dark in color; rough plutonic equivalent of basalt. geologic maps -- Maps that show the types and ages of rock of an area. These maps are used by paleontologists to find areas that are likely to contain fossils they are interested in. glass -- A non-crystaline rock that results from very rapid cooling of magma. granite -- Highly felsic igneous plutonic rock, typically light in color; rough plutonic equivalent of rhyolite. Granite is actually quite rare in the U.S.; often the term is applied to any quartz-bearing plutonic rock. granodiorite -- Igneous plutonic rock, less felsic than granite, typically light in color; rough plutonic equivalent of dacite. graywacke -- Sandstone composed of poorly sorted angular clasts. Ichnology -- The study of trace fossils. igneous rock -- Any rock solidified from molten or partly molten material. impressions -- Prints or marks made when an organism’s body has been compressed (flattened). Impressions are different from compressions because no thin organic material is left behind. interbedded -- adj. Describes beds (layers) of rock lying between or alternating with beds of a different kind of rock. intrusion -- n. Magma (and the rock it forms) that has pushed into pre-existing rock; intrusive- adj. ; plutonic- syn. extrusive- ant. island arc -- n. A curved chain of islands that rise from the sea floor, usually near a continent. The convex side usually faces the open ocean, while the concave side usually faces the continent, e.g., the Aleutian Islands in Alaska; volcanic arc- syn. isotope -- One of two or more variations of the same chemical element, differing in the number of neutrons not the number of protons. kame -- n. A short, steep-sided knoll of glacial sediment. karst -- n. A type of topography formed by dissolution of rocks like limestone and gypsum that is characterized by sinkholes, caves, and subterranean passages. kettle lakes -- n. Lakes formed as water fills a hole formerly occupied by a block of stranded ice. mafic -- Term used to describe the amount of dark-colored iron and magnesium minerals in an igneous rock. Complement of felsic. magma -- n. Molten rock generated within the Earth; forms intrusive (solidifies below the surface) and extrusive (solidifies above the surface) igneous rocks. mantle -- That portion of the interior of the Earth that lies between the crust and the core. marine terrace -- n. A platform of marine deposits (typically sand, silt, gravel) sloping gently seaward. Such a platform may be exposed along the coast, forming cliffs, due to uplift and/or the lowering of sea level, e.g., Marine terraces of coastal Southern California. marl -- n. A loose, crumbly deposit consisting of clay and calcium carbonate and formed in marine or freshwater conditions. melange -- A body of rocks consisting of large blocks (mappable size) of different rocks jumbled together with little continuity of contacts. metamorphic rock -- Any rock derived from other rocks by chemical, mineralogical and structural changes resulting from pressure, temperature or shearing stress. metamorphism -- n. The process of altering the chemical or mineralogical composition of a rock through different amounts of heat and pressure below the surface of the Earth; metamorphose- v; metamorphic - adj. microfossil -- n. A very small fossil, best studied with the aid of a microscope, e.g. foraminifera, radiolarians, and small vertebrate fossils such as teeth. macrofossil– ant. mid-oceanic ridges -- Elongated rises on the ocean floor where basalt periodically erupts, forming new oceanic crust; similar to continental rift zones. mineralization -- The process of replacing any organism’s original material with a mineral. molds -- Fossils formed when the sediment surrounding a buried organism hardens. When the organism decays, its impression is left in the rock and can be seen if the rock is broken open. moraine -- n. A mound or ridge of sediment deposited by a glacier; lateral moraine- n. deposited to the side of a glacier; terminal moraine- n. deposited to the front of a glacier; ground moraine- n. deposited on the land surface. oceanic crust -- n. The Earth's crust which is formed at mid-oceanic ridges, typically 5 to 10 kilometers thick with a density of 3.0 grams per centimeter cubed. oceanic trench -- Deep steep-sided depression in the ocean floor caused by the subduction of oceanic crust beneath either other oceanic crust or continental crust. orogeny -- n. The tectonic processes of folding, faulting, and uplifting of the earth’s crust that result in the formation of mountains. outcrop -- Any place where bedrock is visible on the surface of the Earth. radio-carbon dating -- Method for determining the age of an organic substance by measuring the amount of the carbon isotope, carbon-14, remaining in the substance; useful for determining ages in the range of 500 to 70,000 years. rebound -- v. To spring back after a weight has been removed. red bed -- n. Sedimentary layers composed primarily of sandstone, siltstone, and shale, that are predominantly red in color due to the presence of iron oxides; often used in reference to the Permian or Triassic sediments of the western U.S.
reef -- n. A large ridge or mound-like structure within a body of water that is built by calcareous organisms such as corals, red algae, and bivalves; barrier reef- n. A reef growing offshore from a land mass and separated by a lagoon or estuary, e.g, the Great Barrier Reef of Australia; patch reef- n. A discontinuous reef growing in small areas, separated by bare areas of sand or debris, often part of a larger reef complex. regression -- (n) A drop in sea level that causes an area of the land to be uncovered by seawater. replacement -- Fossilization process that occurs when an organism is completely decomposed and replaced by mineral. rhyolite -- Highly felsic igneous volcanic rock, typically light in color; rough volcanic equivalent of granite. rift -- n. A long, narrow crack in the entire thickness of the Earth's crust, which is bounded by normal faults on either side and forms as the crust is pulled apart; v. To split the Earth's crust; rift zone- n. The area on continents where a trough bounded by normal faults is forming; the site of crustal extension, similar to that which occurs at mid-oceanic ridges; rift basin or rift valley- n. The long, and fairly wide trough that has formed as a section of the Earth's crust has dropped down along faults, e.g., African Rift Valley in East Africa. rock cycle -- The process through which one type of rock (igneous, sedimentary, or metamorphic) is converted into another. subduction -- n. A geologic process in which one edge of one crustal plate is forced below the edge of another; subduct– v.; subduction zone- n. A long narrow area in which subduction is taking place, e.g. the Peru-Chile trench, where the Pacific Plate is being subducted under the South American Plate. subsidence -- n. The sudden sinking or gradual downward settling of the Earth’s surface with little or no horizontal motion. taphonomy -- The study of what happens to a fossil, from the time of its initial creation (e.g. the death of an organism or the imprint left by the movement of an organism) and the time that the fossil is discovered by a paleontologist. For example, shells or bones can be moved my running water, and later be compressed by overlying sediment. Taphonomy is often broken into two parts, biostratinomy and the study of diagenesis. volcanic -- adj. Describes the action or process of magma and gases rising to the crust and being extruded onto the surface and into the atmosphere; also applies to the resulting igneous rocks that cool on the surface of the Earth, including beneath water, which typically have small crystals due to the rapidity of cooling. volcanically - adv. extrusive - syn. plutonic - ant. volcanic arc -- n. A curved chain of islands that rise from the sea floor, usually near a continent. The convex side usually faces the open ocean, while the concave side usually faces the continent; island arc - syn. volcanism -- n. The process by which magma and associated gases rise to the Earth’s crust and are extruded, or expelled, onto the surface and into the atmosphere. weathering -- n. The physical, chemical, and biological processes by which rock is broken down into smaller pieces.